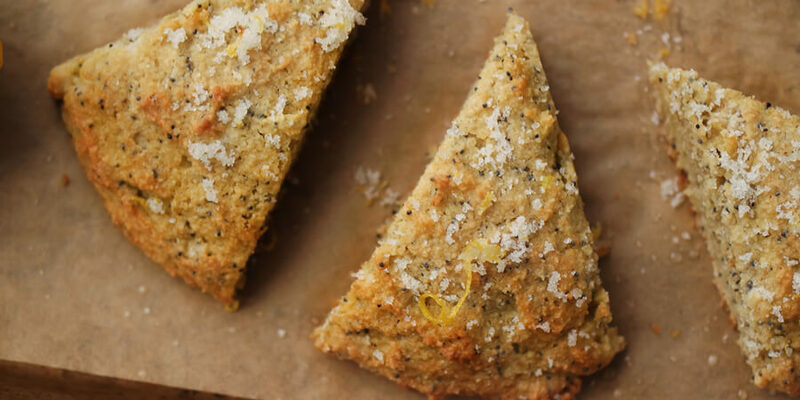 I have never been a lover of the dryness of a traditional scone, but this modified keto scone is the perfect balance between cakey and crusty! 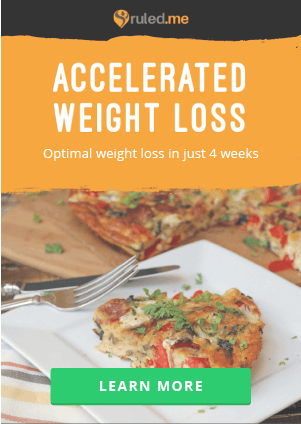 I decided to make this scone different from the other keto scone recipes floating around the internet because I wanted to simulate something more like a muffin center with a crusty exterior. For those of us who love coffee and a scone, it hits the spot. 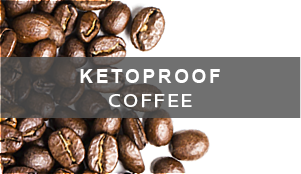 For the ones who don’t drink coffee, it’s still soft enough to enjoy without a hot beverage to wash it down. The method is similar to making biscotti with a double baking process. The wet dough is lightly scored as a guideline for cutting after the first bake. Once it comes out of the oven the slices are cut and separated, sprinkled with lemon sugar and baked again to achieve the crumbly, crusty exterior. 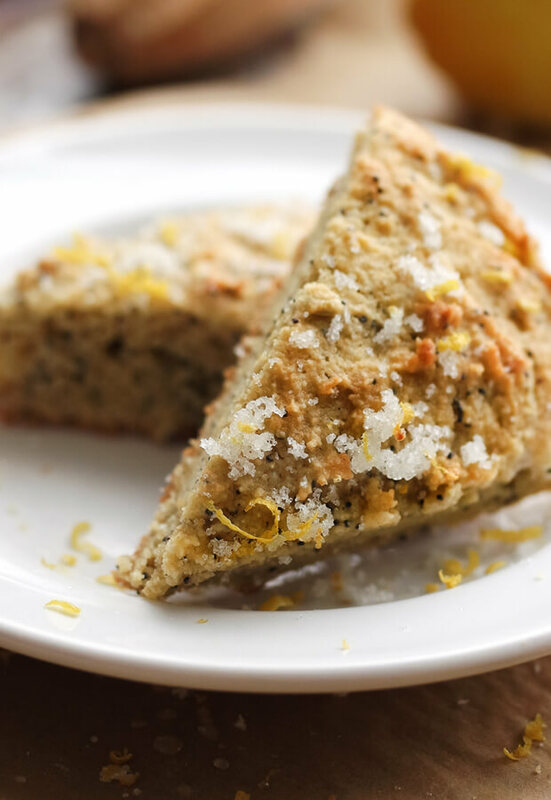 These poppy seed scones are very lightly sweetened and topped not with traditional icing, but with lemon sugar! 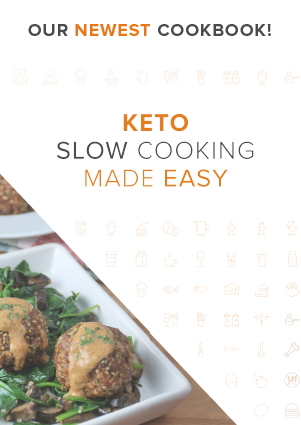 The process is so simple and can be used in other recipes, sprinkled on keto cookies or in tea for an added burst of citrus. 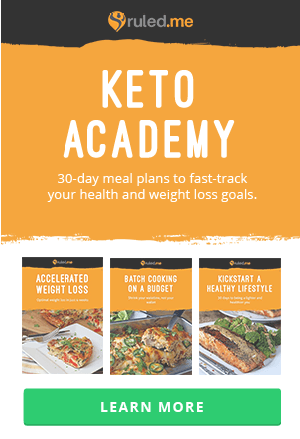 Mix granulated erythritol and the zest of a lemon and mix with a fork for a rough sugar or in a food processor for a refined sugar. Once it’s dry, store in a container and sprinkle away! 1. Heat oven to 350F then line a baking sheet with parchment paper. In a large mixing bowl, combine almond flour, coconut flour, psyllium husk fiber, baking powder, and baking soda. 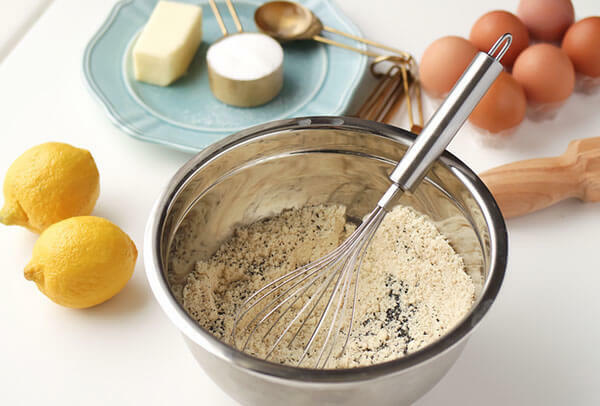 Whisk in poppy seeds until well combined. 2. 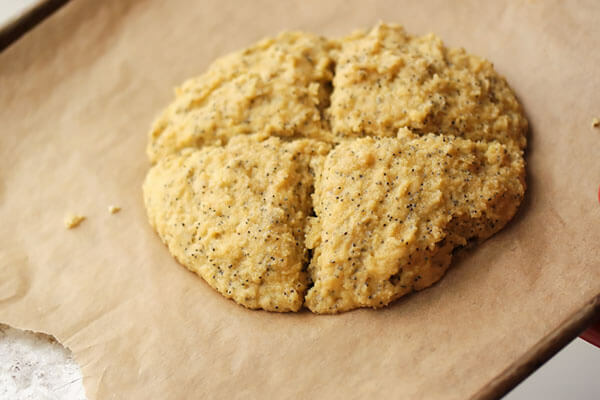 Cut butter into the dry ingredients with a fork, pastry cutter, or your hands until a dough forms. 3. 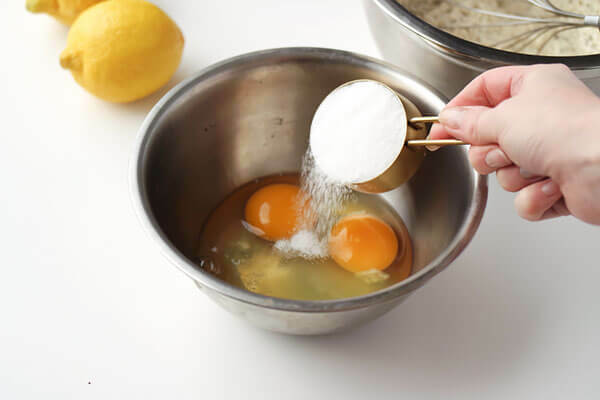 In a separate bowl, whisk together the eggs and sweetener until frothy. 4. 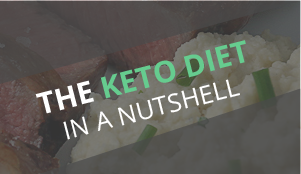 Zest lemon onto a plate, add the sprinkling erythritol. Using a fork, mash the sugar and zest together and set aside to dry. 5. 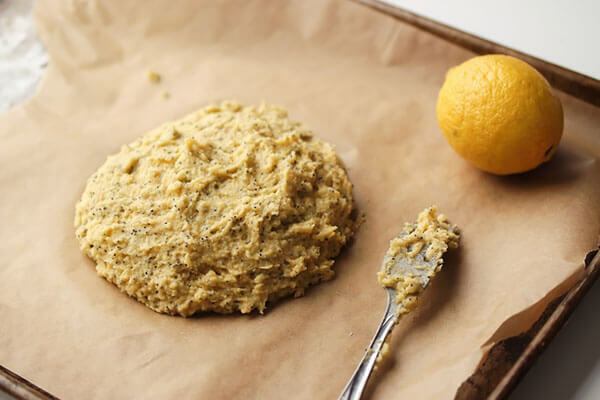 Cut the lemon in half and squeeze the juice into the egg mixture, being careful not to get any seeds in the mix, but the pulp is ok and good for texture. 6. Pour the egg mixture into the dough and mix well. 7. Place the wet dough onto the prepared parchment in a dome shape. 8. Gently score the wet dough in 8 triangles with a knife and bake for 20 minutes. 9. Remove from oven, cut into 8 triangles and separate each slice. Sprinkle with lemon sugar and bake for 10 more minutes. 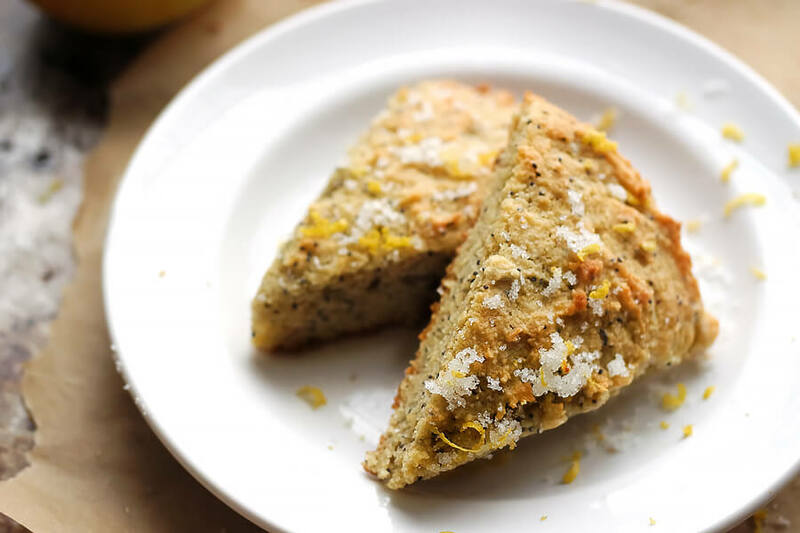 This makes a total of 8 servings of Keto Lemon Sugar Poppy Seed Scones. 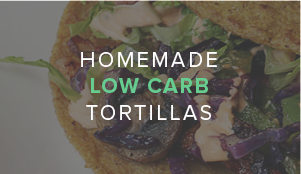 Each serving comes out to be 206.81 Calories, 18.5g Fat, 3.53g Net Carbs, and 6.6g Protein. Heat oven to 350F then line a baking sheet with parchment paper. 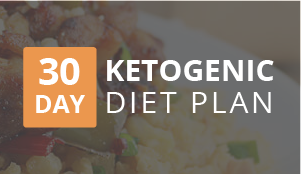 In a large mixing bowl, combine almond flour, coconut flour, psyllium husk fiber, baking powder, and baking soda. 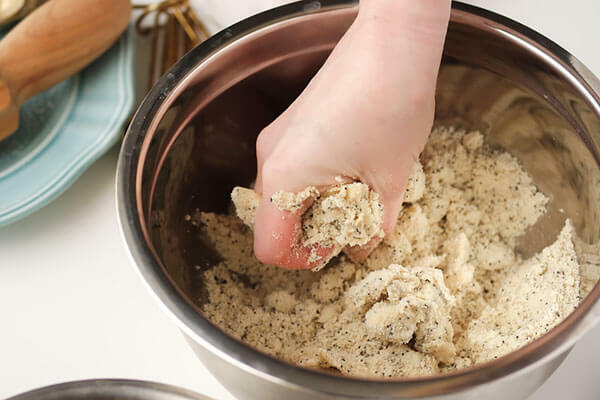 Whisk in poppy seeds until well combined. Cut butter into the dry ingredients with a fork, pastry cutter, or your hands until a dough forms. In a separate bowl, whisk together the eggs and sweetener until frothy. 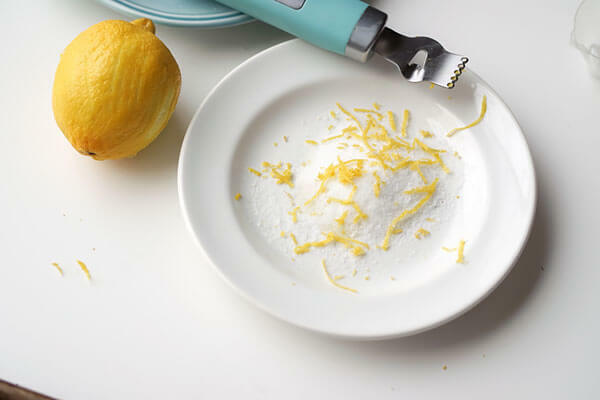 Zest lemon onto a plate, add the sprinkling erythritol. Using a fork, mash the sugar and zest together and set aside to dry. 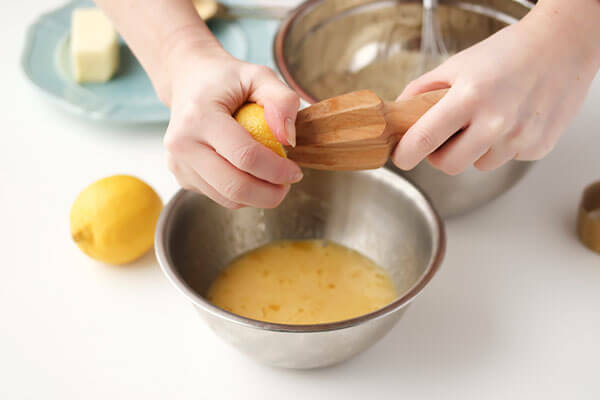 Cut the lemon in half and squeeze the juice into the egg mixture, being careful not to get any seeds in the mix, but the pulp is ok and good for texture. 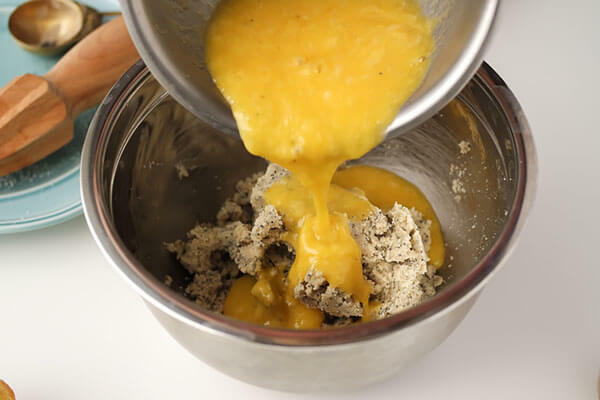 Pour the egg mixture into the dough and mix well. Place the wet dough onto the prepared parchment in a dome shape. Gently score the wet dough in 8 triangles with a knife and bake for 20 minutes. Remove from oven, cut into 8 triangles and separate each slice. Sprinkle with lemon sugar and bake for 10 more minutes.